March of the Penguins did a lot to make the monochromatic birds the go-to creature for entertaining the kiddies. Happy Feet happened soon after, and the popular Madagascar franchise also featured penguin character that were quite popular, all of this along with a general rise in the presence of the little flightless fish-eaters in pop culture. I’d gotten the impression that this had died down a bit and the focus had shifted to pandas, or chipmunks, or prairie dogs, or whatever other silly creature was stealing all the attention from the sharks, dinosaurs, and sharkosaurs that rightly deserved it. 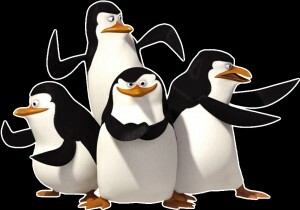 Apparently I was wrong, as those Madagascar penguins have never gone away and even catapulted to the top of the kid-TV charts (just under Spongebob), and now the penguin mania is about to hit its second wind, as Happy Feet 2 and Mr. Popper’s Penguins will now be followed by a spin-off Penguins of Madagascar film. I’ve managed to avoid Madagascar, but I’ll admit this sounds like the most fun of any of the aforementioned films. There might be no more sickeningly gooey kids movie than Happy Feet in the last few years and Popper’s looks as dumb as possible (even if me and those penguins go back to when Moses wore short pants) so a caper-flick centered around vaguely villainous penguins might not be so bad. The film will be written by Megamind scribes Brent Simons and Alan J. Schoolcraft, with no set director as of yet. It’ll be a few years before this gets off the ground so if you’re interested in this film but remain kidless, you till have time to knock someone up, poop out a kid, and raise that kid so it’s cogent enough to see a penguin movie before the flick comes out. Hurry!